Advent candles seem to be rather in fashion this Yule and they make a change from advent calendars. There also seems to be a greater variety of shapes, styles and colours than I've seen in the past. If you want one you can keep lit for a long time each evening, there are pyramid advent candle, and advent pillar candles in which each date will burn for about 2 hours. Another option is to get four candles (no, not ‘fork handles’, for those old enough to remember the Two Ronnies’ comedy sketch) and put them on a traditional advent ring, wreath or crown. Traditionally, one candle is burnt each week of advent. You can, of course, burn a tea light each evening in the run-up to Christmas instead of using an advent candle. Big name chandler Yankee Candle has produced some lovely advent calender gift sets this year in which each window you open contains a tea light or votive candle - each with a different scent. There are Yankee Candle advent calender carousel gift sets and also Yankee Candle advent calender houses. I think they are lovely, but a rather more pricey than my single candle from Aldi. 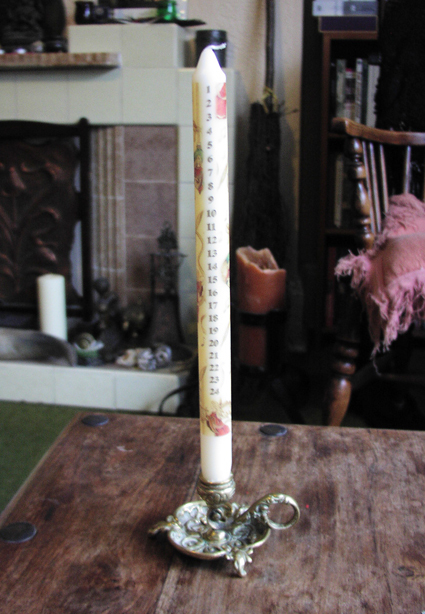 To make up a similar advent candle set counting down to Yule or the Winter Solstice on December 22 rather than Christmas on December 25, you could buy a selection of tea lights and make 21 or perhaps 22 tiny socks out of felt - each big enough for a single candle. Then you would pop the candles in the socks and hang them on a ribbon to give them to a pagan friend or loved-one as a gift. I'm sure it would be appreciated. 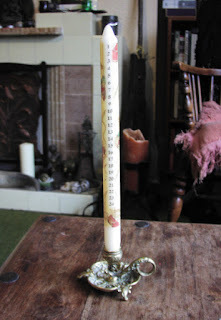 By the way - you might spot that the antique candle holder my Aldi candle is sitting in is the one on the front cover of on my book Pagan Portals - Candle Magic: A witch's guide to spells and rituals.